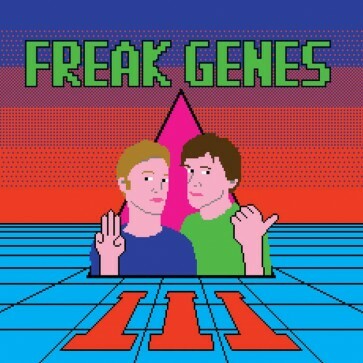 3rd LP from Freak Genes, they make cleverly deranged punk music for freaks, by freaks. Whether it's in their genes or acquired from years of dysfunctional ideas gone awry playing in bands, this album is a synth in your face. For their third LP, Freak Genes have unearthed 12 more sort-of-pop sort-of-not songs for your ears to enjoy. Making use of a synthesiser found in a skip and a guitar that won’t stay in tune, III is garage rock meets Gary Numan. There are some hit tracks, weird stuff and almost intentional accidents. If you like making functional use of dysfunctional ideas, this is for you…and if you love DAF, The Units, Lodger-era Bowie, 154-style Wire or The Flying Lizards then so much the better. Freak Genes III was made by Charlie Murphy (Red Cords) and Andrew Anderson (Hipshakes / Proto Idiot) and mixed/mastered/made good by Mikey Young. Strictly not for norms.